Riverbend Hotel and the Marikina Hotel are 2 full-fledged hotels in Marikina City which offer the complete line-up of services a standard multi-star hotel offers. As for budget hotels who provide transients who look for shorter stays, hourly rates and quick check-ins, there aren't any yet in the city. But lately, a new budget hotel is being erected along along the corner of Pangustura and Pambuli streets. 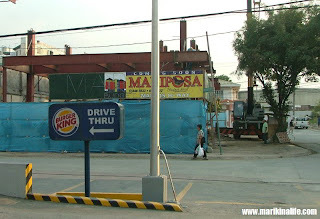 Just behind Burger King along Marcos Highway is where a new Mariposa Budget Hotel will be established. A few months back, this lot was being cleared in preparations for construction which is now undergoing. Their location is conveniently located near Marcos Highway and Felix Ave. in Cainta and is in front of an access road leading to Q-Plaza. For more inquiries, call 646-5522 or 646-5533.